The Japanese Cedar is a lovely, small, conical conifer tree displaying colourful, evergreen foliage, for which this species is known. The herringbone shaped and surprisingly soft foliage is creamy yellow in spring, darkening to green in summer and then adopting bronze and purple shades in the cold winter months. Brown cones dangle on the ends of the pendulous branches in autumn. Cryptomeria japonica 'Sekkan-sugi' may have an odd shape when young but quickly develops into a graceful conical shape and provides a magnificent focal point, especially in small gardens. 'Sekkan-sugi' needs a sheltered position away from cold winds and scorching sun, and likes a moist neutral to acid soil. The national tree of Japan, Cryptomeria is often planted near temples. 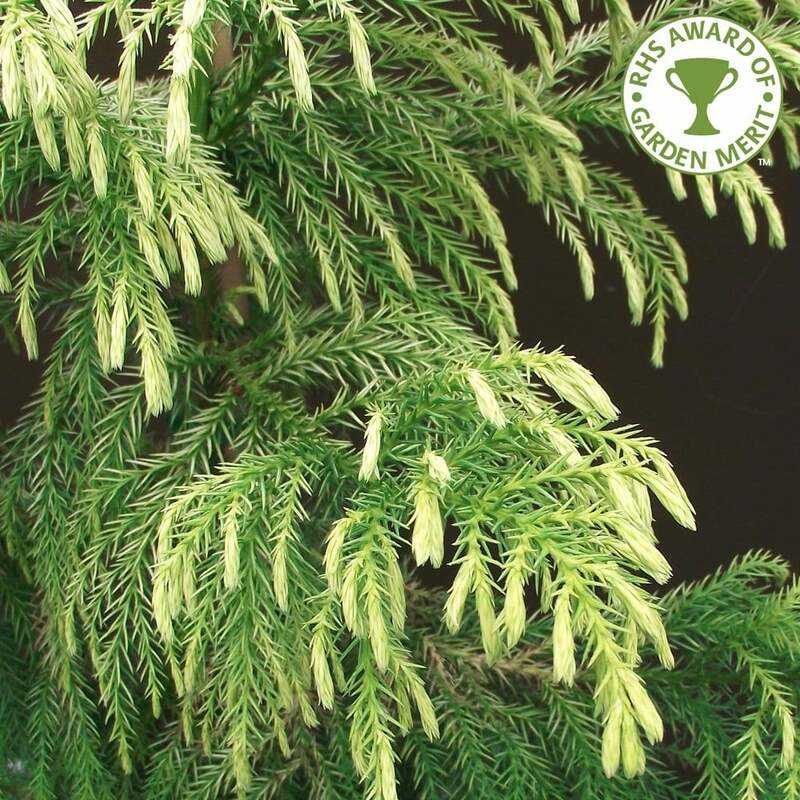 We also offer a larger and less pendulous variety called Cryptomeria japonica Elegans. Our pot grown Japanese Cedar trees can be planted at any time of the year. To prepare the planting site, remove all weeds and grass within a metre of your desired planting hole. Dig a square hole as deep as your root mass and approximately 2x as wide. To help your tree establish more effectively, we advise applying root grow (sprinkle in the hole for pot grown trees), especially if you have poor soil. Gently loosen the tree roots and place into the planting hole. Using 50% of the original soil and 50% compost, fill in the hole and firm around gently, making sure not to bank the soil up around the collar of the tree. We recommend using a stake and tie kit. Visit the help section for further information. If you’re planting in spring, summer or dry weather, water well and regularly for the first few months. Make sure to keep an eye on young Japanese Cedar trees and increase watering if there are extended periods of hot or dry weather. If you’re planting in autumn, you may only need to water your tree a little. We stock a range of irrigation kits, suitable for a variety of planting schemes. Japanese Cedar trees do not require a lot of pruning. Simply remove any dead, diseased or awkwardly placed branches from your Cryptomeria Japonica Sekkan-Sugi tree as and when you see them.